About nine inches long. Dark slate gray upper parts. Dull black crown and tail. Underside slate gray. Long erect tail, chestnut underneath. A mocking bird, its varying melodies follow no discipline and it will imitate birds, frogs, cats, chickens, cartwheels, even humans calling to it and it has a harsh cry like the mewing of a cat. Abundant in the eastern and northwestern U.S. and in Canada, north to British Columbia, Hudson Bay and Nova Scotia. Winters in the southern U.S., Central America and the Caribbean. Likes brushy woods, swampy thickets, and frequents farms, towns and gardens. Intelligent bird, friendly to humans. Likes baths and loves to preen its feathers. Runs along the ground. Hunts ants, crickets, grasshoppers, beetles, spiders and caterpillars. Catches moths, flies and other flying insects on the wing. Likes many fruits, which make up a significant part of its diet. Catbirds gather to drive away intruders with loud, obnoxious cries. Builds loosely woven nests of twigs, grass, leaves, bark and roots lined with fine grass in bushes, vines and low trees usually less than ten feet high. Lays three to six deep bluish green eggs. Frequently raise two broods. 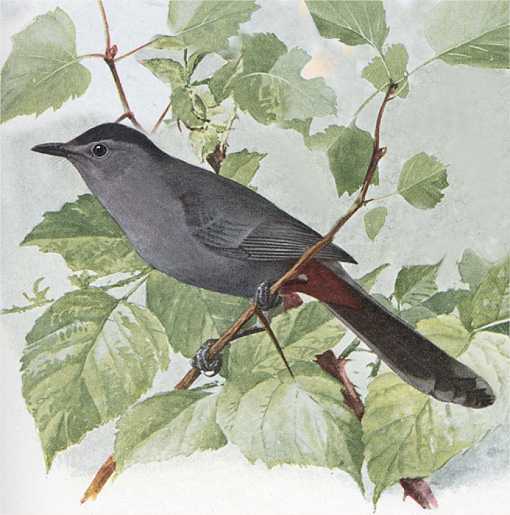 If a brood is orphaned, neighboring catbirds will feed and raise them. 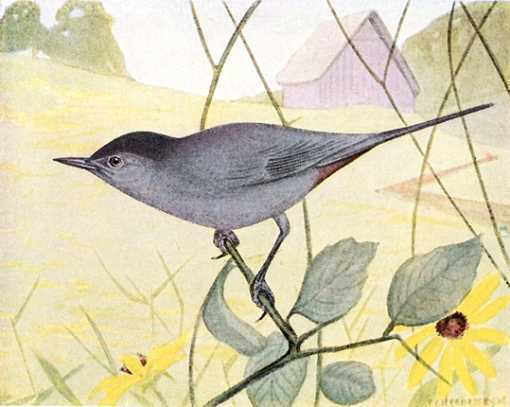 A USGS research center web site and an older version of an Oklahoma Department of Wildlife Conservation brochure included Catbirds and Thrashers as users of platforms. In 1993, Catbirds and Thrashers were deleted from the brochure because of a lack of documentation. However, Gilbert H. Trafton, the author of “Bird Friends”, 1916, recommended platforms open on all four sides for Thrashers, Catbirds and Song Birds. Just what experience this advice is based on is uncertain. Chances are probably slim of attracting catbirds, brown thrashers and song sparrows to any particular shelf. Try mounting the open platform low behind a bush on a wall or fence so the parents can approach the nest unnoticed, higher if predator cats may be about, amidst a vine covered wall would be ideal. Another alternative is something similar to the concave shaped cups made of mesh some have made for blue jays. Attach corners to branches creating a trampoline effect and conceal in a bush. Use a net made from natural cloth material, not metal mesh. Attract catbirds naturally. Plant buckthorn, raspberry, strawberry, elderberry, blackberry, blueberry, mulberry, and poke berry bushes; Virginia creeper and choke cherry, sour gum and black cherry trees.